Battle of Bighorn Summary and Definition: The year that the Battle of Little Bighorn took place was in 1876 and was part of the Great Sioux War. The location was near the Little Bighorn River in Montana. 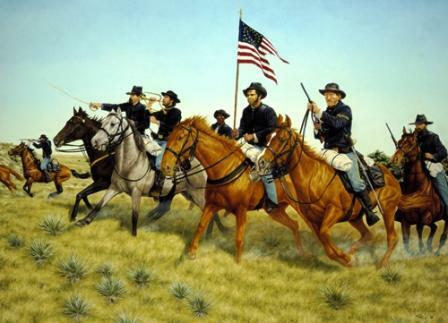 The combatants were the 7th Cavalry Regiment of the United States Army led by General George Custer and a combined force of Sioux, Arapaho and Cheyenne warriors led by Chief Sitting Bull. 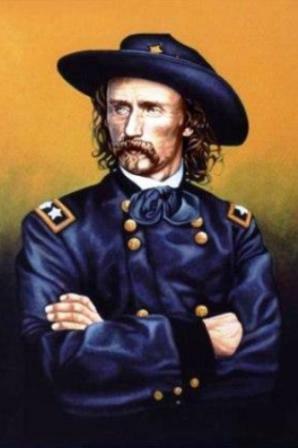 Custer underestimated the size of the Native Indian forces which led to his defeat and the deaths of the men of the 7th Cavalry under his command. The Little Bighorn is a river in the West central US flowing north to the main Bighorn River. The US government then that ordered all Indians to return to the designated reservations by 31 January, 1876, or be deemed hostile. The History of the Battle of Bighorn including details of the cause, reason, and summary. The dates and years of the Battle of Little Bighorn - when and why the battle started and the consequences of the conflict. Who fought in the Battle of Bighorn? The combatants of the Battle of Bighorn were the US Cavalry and Sioux, Cheyenne & Arapaho Indians. When did the conflict start and when did the conflict end? What were the causes, what was the significance, what were the results and effects? Interesting history and facts about this historic conflict in the fast facts sheet. Chief Sitting Bull and General George Armstrong Custer. What were the causes of the Battle of Bighorn? Some of the history and causes of the Indian Wars and battles were dictated by general policies & beliefs which shaped the historical background to the causes of the Battle of Little Bighorn. 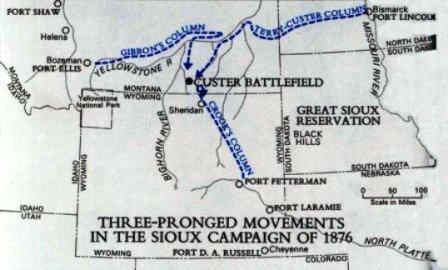 The location of the Battle of Bighorn is indicated on the map which illustrates the US three pronged movements headed by Gibbon, Terry and Custer and General George Crook during the Great Sioux War. The effects and significance of the Battle of Bighorn in history is that the Battle of the Little Bighorn was the beginning of the end of the Indian Wars. The nomadic hunter lifestyle of the Plains Indians was lost forever. 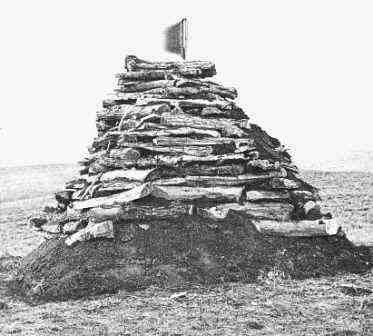 The languages, culture, religion, beliefs and ceremonies of conquered people fell into decline. The news in the East of the disastrous defeat at the Battle of Little Bighorn shocked people who were accustomed to battlefield victories and convinced of their inherent superiority and claim to manifest destiny. The US Government expanded the Army in the region by 2,500 men following the Defeat at the Battle of Little Bighorn. The Battle of Little Bighorn led to increased intolerance of the Native Indians and a determination to place them on a reservation in order to 'civilise' them. The Little Bighorn Battlefield National Monument (formerly Custer Battlefield National Monument) preserves the site of the Battle of the Little Bighorn. The graves of those killed in the Little Bighorn Battle are located around a granite monument marking the spot of 'Custer's last stand. The first memorial on the site was assembled by Captain George K. Sanderson and the 11th Infantry who buried the mutilated bodies where they were found. In 1877 the body of George Custer, who had been buried at Little Bighorn, was re-interred in West Point Cemetery. This short History Timeline of the Battle of Bighorn provides fast facts and information about the history, years & dates, key events and famous people who fought in the Battle of Bighorn. 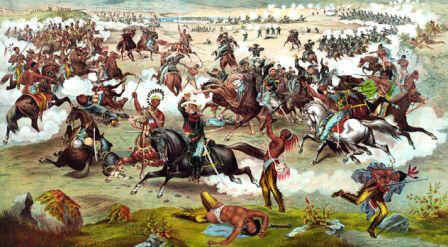 1876 26 June: The Battle of the Little Bighorn begins. The major force of Indians ride to attack General Custer killing all of his 231 men who included Custer, his two brothers, Tom and Boston, his brother-in-law, James Calhoun, and his nephew, Autie Reed. The infamous conflict became known as the Battle of Little Bighorn. 1876 July: The stunned and angry reaction to the US defeat at the Battle of Little Bighorn prompted a massive outcry and the US government flooded the area with troops, forcing the Indians to surrender or flee. 1877 July: The body of George Custer, who had been buried at the site of the Battle of Little Bighorn, was re-interred in West Point Cemetery. Battle of Bighorn. Discover the key years, famous people and events of the Battle of Bighorn together with the causes and effects of the war, conflict and battle. 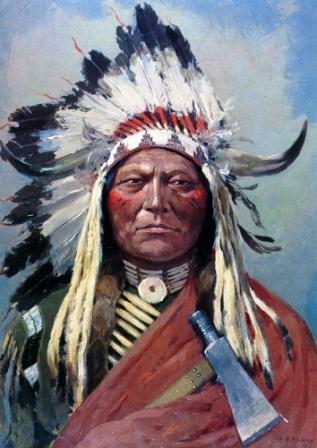 Pictures have been include wherever possible which show the battlefield, clothing and weapons of the Native Indian tribes and their leaders who fought in the Battle of Bighorn. The Battle of Bighorn. The videos enable fast access to the information and the many facts featured on this subject of the Battle of Bighorn.